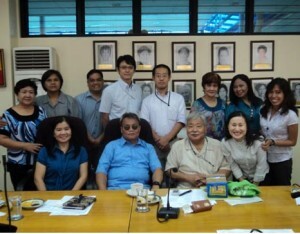 NCDA Officials and the JICA Team for the Non-Handicapping Environment (NHE) Project for Rural Areas welcomed and briefed visiting expert Mr. Yutaka Takamine (seated 3rd from left) on the Councilâ€™s programs and status of NHE Project last September 14, 2010. Mr. Takamine is the new Short-Term JICA Expert for said project. The NCDA-NHE Project team took the opportunity to warmly send off Mr. Makoto Iwase (standing 5th from left) who will be going back to Japan after more than 3 years of working for JICA Philippines.